NewsBin is a multithreaded news robot that automatically downloads and decodes binary posts to usenet newsgroups. NewsBin will take full advantage of high bandwidth internet connections by allowing multiple simultaneous connections to your news server or servers. It re-assembles multi-part posts across multiple servers and includes realtime rendering of thumbnails when downloading images. NewsBin supports regular expression parsing for complex filtering capabilities based on subjects or filenames and provides file size filtering. A spam filter function identifies likely spam posts that are either password protected RAR files or RAR files containing trojan executable files. If you want to download files from Usenet with a minimum of hassles, Newsbin is the tool for you. Usenet Decoding Methods: NewsBin can decode yEnc and uuEncoded files which are posted to Usenet newsgroups. Built in RAR and Split File Processing: Use the AutoRAR feature to combine RAR and Master Splitter files and extract the contents. Newsgroup Organization: You can configure NewsBin to act on an individual newsgroup or a custom grouping of newsgroups. On-the-fly Download Prioritization: NewsBin can get the important stuff first because you can adjust the download queue in real time. Multiple Server Support: Configure multiple news servers for simultaneous use. This allows you to download from a free server supplied by your ISP and use a pay server to fill in whatever is missing. Automatic Download Mode: Automatically download files while you sleep. Dual Core support: NewsBin makes full use of Dual Core CPU's, multiple processor systems, or CPUs with Hyperthreading enabled. Advanced Download Management: A temporary "Scratch List" is available to park posts for downloading later. Automatic Header Updates: NewsBin has a mode where it will periodically download headers from all your selected newsgroups. This way you always have the most recent headers available for browsing. 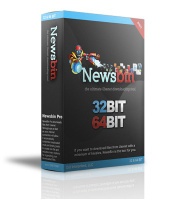 NZB File Support: NewsBin will download file represented in NZB files. It can be configured to automatically load NZB files from a specified folder, load an NZB from a menu option, or simply click and drag an NZB onto NewsBin to download the files listed in the NZB file. MP3 Organizer: You can use MP3 ID3V2 tags to organize download folders by albums and artist. Optimal Resource Management: After many iterations of optimizations, NewsBin now uses significantly less RAM than previous versions. You can now load large newsgroups with 10 million headers in about 150MB of RAM. 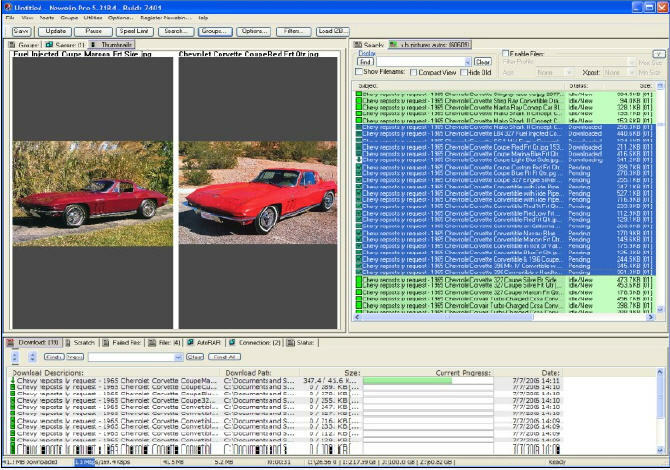 Image Database and Viewer: NewsBin includes an option to enable a database to store and search images. There is also a built-in image viewer. Posting Capabilities: Post requests, short text messages, and files to the newsgroups. Interface Customization: Move sections around and apply different color schemes to identify post status. is a yEnc and NZB compliant newsreader with many features that make newsgroup downloading easy. allows you to create RSS (Really Simple Syndication) channels & Weblogs (Blogs) quickly and easily. It is a powerful yet intuitive and easy to use visual file and directory comparison tool for Windows. is a free windows utility allowing you to open and view any file located on your computer regardless of format file was saved. is a powerful RSS feed generator, editor and submitter; With it can easily create RSS feed for web site. is a full-function NNTP client and RSS/RDF aggregator for Pocket PC.